Editor's note: This is part of an occasional series in which reporters drop in on interesting classes throughout the university's eight academic divisions. The course: Free Will and Responsibility. 3 credits. Offered by the Department of Philosophy in the Krieger School of Arts and Sciences. The instructor: Sean Greenberg, an assistant professor who specializes in early modern philosophy and has a strong interest in moral psychology. He is currently researching early modern conceptions of emotions and the will. His teaching assistant is Marty Moran, a fifth-year doctoral student. Meeting time: 1 to 4 p.m. on Thursdays, Fall 2004. Syllabus: Are we truly in control of our actions? Are our decisions really up to us? Students examine views about what is involved in saying yes to these questions and about the implications of saying no. They also consider whether we can be responsible for emotions, dreams and addictions. Course work: In addition to participating actively in class discussions, students must write two pages each week on some issue arising in the papers considered during that week's class meetings. The assignment, worth 10 percent of the semester grade, can be fulfilled by summarizing a line of argument, analyzing a difficult passage or criticizing an argument, and it must be handed in the day before the class during which the material will be discussed. Students must also write a five-to-seven-page paper, which is open to a rewrite and worth 40 percent of the course grade, and a 10-to-12-page final paper that counts for the remaining 50 percent of the grade. Required reading: Assignments are drawn almost exclusively from contemporary journal articles on reserve at the MSE Library. Texts include Elbow Room: The Varieties of Free Will Worth Wanting by Daniel Dennett and Free Will, a collection of articles edited by Gary Watson. Overheard in class: "Somebody bowls you over while walking across the quad. You get upset. Why? Because our instinctual response is to get mad. You expect people to watch where they are going because bumping into someone like that is a violation of normal interpersonal behaviors. But what might excuse them? If the person says he's sorry, that he tripped over a bump, then that's not something he could be responsible for." 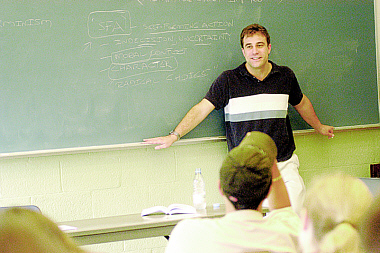 Students say: "Having taken a previous class with him, I felt that Professor Greenberg's class would be well worth taking. I was attracted to the class because it focuses on contemporary debates of free will instead of taking a more historical approach to the topic. He is an energetic and dynamic lecturer who engages his students in thought-provoking discussions about the material. Not only does he want his students to get a handle on the material, Professor Greenberg is also committed to helping his students become better writers and thinkers; he must spend hours commenting on our weekly response papers. He's dedicated to improving undergraduate education at Hopkins, and this alone is reason enough to take his classes." — Haley Morrisson, 21, a senior philosophy major from Princeton, Mass.